If you’re an online marketing company, then your business relies on strategy. You have to be up to date on changes and trends in the market, on user demands and desires and you have to know about each of your clients’ businesses – enough at least to be able to help them effectively promote themselves on the web. With all this on your plate, wouldn’t it be nice if you simply had a proven path to success laid out in front of you? 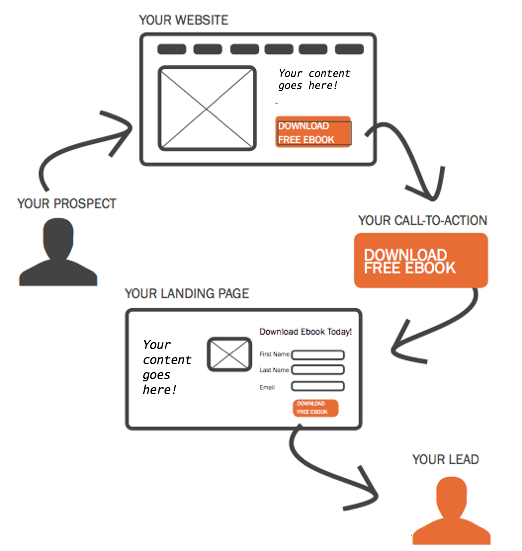 The beautiful thing is that such a path does exist – it is the pathway to inbound marketing. This specific strategy for comprehensive, full-circle online marketing takes some time and commitment to learning up front, but it is a systematic process for success for each client you work with after that! Now, we know that every client is unique. We’ve been an active and successful online marketing company for years ourselves, so we understand the importance of offering customizable services. However, we also know that if there is a system that works, your clients will want you to use that system! Customize the details along the way, but stick to the process that you know will produce results. Believe us, your clients will thank you! So what does this secret path for online marketing companies look like? Well, it looks a lot like the diagram shown below. There is an entire section of the full image that is missing here… to really see the full-circle approach, you’d have to continue the diagram past the lead. The lead isn’t the ending point. In fact, he is more like the middle. Your success is in making that lead a buying customer and even eventually, a promoter of your business! That happens through automated marketing process and email nurturing, etc. But that’s for another blog! For today, this portion of the path is enough to get you started. A Site Full of Great Content: The process of developing a great site includes excellent web design, quality writing and also promotion via SEO strategies. Your site should be a user-friendly, professional representation of your brand. And you should be actively inviting potential customers to visit it. CTAs: Once you get traffic to your site, you need to give your users something to do. They need something to catch their attention, something to click on, something to download. You need capture their interest within the first 30 seconds that they are on your site. Killer Landing Pages: The CTA buttons need to lead to pages that accomplish your actual goal. See, you don’t just want to be known as a site that gives away great resources (although that’s a great thing to build a reputation for), but you need to leverage this in order to collect information. That’s how a smart online marketing company ends up with leads. Be sure to word your landing pages carefully and only require fields that are necessary and will be helpful for your sales team in their follow up.